I know of two other fatalities at Manton. Polish guy threw himself down No.2 shaft by crawling under the gates sometime in the late seventies or eighties. Chap got cut in half at No.2 shaft when the winder set off as he was getting on the bottom deck of the cage. My 4x Great-Uncle John Goodall, Killed In A Explosion of firedamp At Garforth Colliery In 1855, Aged11! Mining Accidents - John Hinchcliffe, age 23 Date: 13/05/1853, Whitwood Colliery, Town of Pontefract, Owner: Henry Briggs, Fell down the shaft. Mining Accidents - GOODALL John, age 11, 19/03/1855, Colliery: Garforth, Leeds, Yorkshire, Owner: R. Gascoigne, Explosion of firedamp. I have been asked to help to try to find out details of an accident at Upton Colliery which took place on June 4th 1940. The details are below. 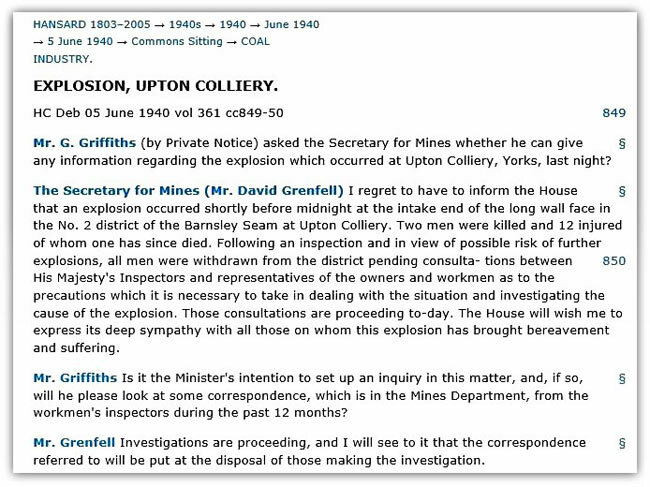 Two (distant) relatives were said to have been involved in a mining accident at Upton Colliery, Yorkshire which took place during the first week in June 1940. One of them survived but was injured, the other one - Jack (John) Foster - died twelve days later in Pontefract Hospital. I have found a reference in Hansard which states that two people died initially, and one died later (accident date 4 June 1940). There is an article in the Barnsley Chronicle (June 1940) which refers to nine men having died. Jack's name is not there. I have looked on the Coal Mining History Resource Centre site - but there is no reference to this accident and I can't find any other information about it. Was Jack involved in the major accident - or had there been two accidents within a couple of days of each other? I can find information relating to an accident at Lepton on the same date. The details include identical named to those killed in the Upton accident. It looks as if the accident was at Upton not Lepton. Could you clarify if this is correct please? LEPTON Huddersfield, Yorkshire. 4th. June 1940 - JH Foster, 36, Collier Died 18th June. Should this be Upton Colliery and Could this be Jack? Thank you for maintaining your site - I have been so fascinated to read your information and facts on day to day life of the miner. Just a small correction I can offer on my grandfather, Edward Plant whose life I have been researching. He died on 02 Dec 1930 aged 33 years leaving a widow and 7 children under 10. The accident - roof fall- occurred on 05 Nov 1929 nearly a year earlier. The death certificate states that he died as a result of his injuries -fracture of the spine and died from toxaemia (blood poisoning) pyelonephritis and paralysis of bladder. Sadly, like many, the irony was that after serving and surviving as a soldier on the Western Front he should lose his life in the mine. 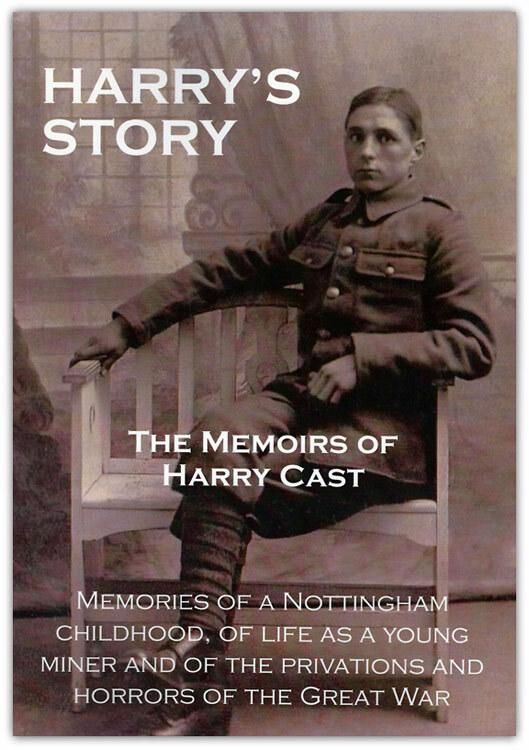 I have just published the memoirs of my husband’s great uncle Harry’s Story and the following is an extract from it which relates a death in Gedling Pit. Dorothy Ritchie at the Local History Library told me of your research into pit deaths and I thought you might be interested. “A few weeks later an event happened in the pit in the district in which I worked which will never leave me. I would inform my reader that though deaths in the mine was not ‘usual’ they were certainly not unusual. Apart from explosions, such as Senghenydd in South Wales and Whitehaven in the north east, in which hundreds were killed, there was an average of around 400 individual deaths each year. This tragedy came upon us during an afternoon shift around five o’clock. One of our mates (ponydriver) who we called Young Teggatt, he was fourteen and few months old, was killed. He was bringing a train of full wagons from the coalface to the main road, he was riding on the shaftiron (the connecting rod from the pony’s shafts to the wagons); it appeared that a piece of lagging (a flat piece of timber placed in the roof) had by pressure become dislodged and was protruding at an incline. Apparently this piece of lagging was caught in the top of the pony’s collar and brought about thirty tons of stone and dust upon Young Teggatt and the first wagon. The pony just escaped ‘the fall’. About this time I was bringing my ‘run’ of full wagons to the junction joining each road, I jumped off the shaftiron in order to fix the point of the track and noticed a cloud of dust which was moving from the adjoining road and it immediately enveloped me. I knew at once that it was from a heavy fall of roof. Straight away I hurried down this road (gate) to see what had happened. What I saw was a great shock to me. The pony was pinned to the side with a mixture of lumps of stone and dust. I could neither hear nor see my comrade. I moved some of the lumps of stone from the pony’s shafts and managed to release him, then I ran to the main road to get help. I did not know what had befallen Young Teggatt, he could have been behind the wagons. The men got to work removing the debris and after about twenty minutes our mate was reached but alas he was dead. Suffocated by dust and no doubt internally injured by huge pieces of the strata. Hello. 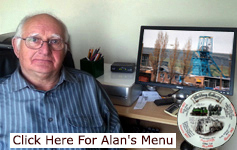 I just want to thank you for your website and information about the Welbeck colliery. I had a newspaper clipping about the death of my grandfather, Richard Giles, but it didn t have the date on it. Now I know it was 20-6-1935. My mother, Phyllis, helped her mother raise her four younger brothers and was allowed to go to school only for half days in order to help with the chores.